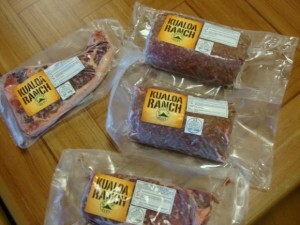 Lately, I’ve been buying grass-fed beef when possible and just found out that Kualoa Ranch sells 100% grass-fed beef. This is awesome because Kualoa is only about 10 minutes away from my house, we get to eat a healthier product, and also help support this local east side ranch. Kualoa Ranch cattle are raised on a 4,000 acre property and free to roam a 1,500 acre pasture. The herd is primarily made up of a cross between Angus, Brangus, and Hereford stock. The grass-fed cattle produces leaner cuts of meat, which is lower in fat. The production process takes place completely in Hawai’i. The cattle are slaughtered at an FDA inspected slaughterhouse in Campbell Industrial Park and processed at Wong’s Meat Market. 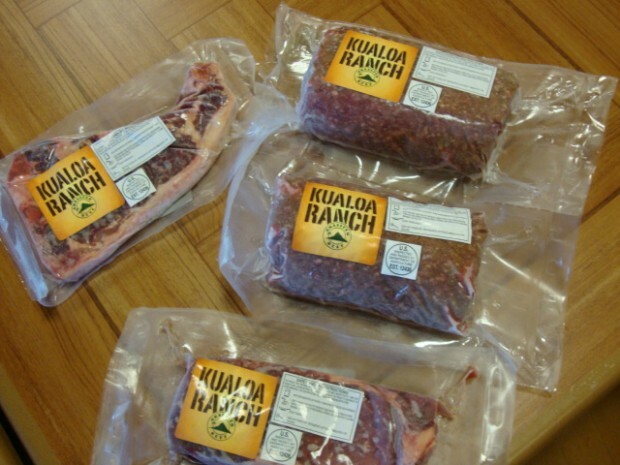 To buy some meat, all you have to do is stop by Kualoa Ranch’s restaurant. Kualoa offers ribeye, t-bone, teri beef, and ground beef. The meat is available on a first come first serve basis. You can even go online ahead of time and reserve your meat. The last time I went to Kualoa I picked up a portion of ground beef, sold in a 2 pound pack for only $8.00. This price is cheaper than the grass-fed ground beef that I buy at Safeway or Costco. In the past couple weeks I made two great batches of Bolognese sauce and have to say I loved the quality and taste of the meat. Grass-fed does have less fat and can be on the tougher side, but a with the help of a longer simmer, my meat sauce was tender and delicious. The next time I take the beagles to Kualoa park, I will be stopping by the Ranch to see what other cuts of beef are available for me to buy. It’s nice to see “fresh farm, direct to customer” beef is available in my neighborhood. You’re lucky you only have to go 10 minutes away from your house to get grass fed meats. Not all of us have a local place to eat so healthy. I’m fortunate to have stumbled upon La Cense Beef where I can buy meat online. They have the best grass fed beef that can be delivered directly to your front door. It’s so convenient. I highly recommend them.